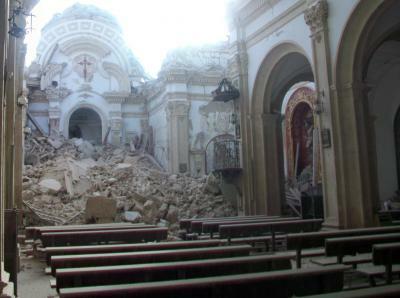 This is the Church of Santiago de Lorca, destroyed in the earthquake of 2011. Credit: Antonio Periago Miñarro. Enjoying Spanish participation, an international group of researchers have analysed the most recent history of the Alhama de Murcia fault. They discovered that it has experienced six major earthquakes above 7 on the Richter scale. According to the scientists, this provides "convincing evidence" that the maximum earthquake magnitudes in the area are higher than originally thought. Since 2001, researchers from the Universities of Barcelona, Leon, Complutense de Madrid (UCM), Coimbra (Portugal), Aahus (Denmark) and the National Autonomous University of Mexico have been working on the Alhama de Murcia fault in order to identify those high magnitude earthquakes that have occurred during the Quaternary period – the most recent of geological ages. "Due to lack of information, up until just ten years ago there were no geological data on paleoseismic activity for the active faults in Spain and very little had been invested in studying their geology. The evidence used to understand active faults came merely from historical seismic records that hardly collected data on the largest of earthquakes related to these faults. As geology can go even further back in time, the earthquakes that we have found are bigger and of a greater magnitude," as explained to SINC by Jose J. Martínez Díaz, researcher at the UCM and coauthor of the study published in the journal 'Geological Society of America Bulletin'. This fault is a fracture plane of the land that crosses the entire earth's crust. Therefore, to identify the prehistoric earthquakes in its walls, scientists had to make surface excavations perpendicular to the fault (trenches of between 20 and 30 metres long and 4 metres deep). This allowed for them to take an exceptionally extensive paleoseismic record. As Martínez adds, "when large earthquakes exceed magnitude 6, they usually break at the surface and as a result, we have been able to identify this in their walls." These tectonic deformations were dated using carbon-14 and infrared stimulated luminescence techniques. In order to understand the behavioural patterns of the Alhama de Murcia fault, the researchers had to reconstruct hundreds of thousands of years "much more than the Americans or the Japanese, who can understand their fault patterns by studying just 10 thousand years." This is because faults in Spain are slow-moving and there is therefore much more time between major earthquakes (to the tune of thousands of years) compared to much faster-moving faults like San Andreas in California. According to their estimations, the Alhama fault would be created more than 9 million years ago and would have caused earthquakes from the outset thus shaping the landscape of the region. "It was in our interest to detect the seismic activity from the Quaternary period, or, in other words, earthquakes that occurred more than 1.8 million years ago. In total, we have identified a minimum of six earthquakes of high magnitude during the period studied (more than 300,000 years) but we know that the real number is actually much higher. In some cases, sedimentary evidence could have disappeared or maybe they can be found in parts of the fault that have yet to be studied," outlines the researcher. Another revelation according to the article is that the area could suffer from a stronger earthquake than originally thought. "During earthquakes, the entire length of the fault does not break. It does so in segments. We have proven that this fault could break at once at the two western segments, from Góñar (Almería) to Totana (Murcia) causing at the same time an earthquake of a magnitude above 7," explains Martínez. "This fault has already produced an earthquake of magnitude 6.5 or 7 thousands of years ago, and could do so again tomorrow. As a result, it is vital to bear in mind the earthquake risk calculations and building codes on the area," outline the researchers. The seismic hazard map forming the basis of the Spanish Seismic Resistance Construction Standard assigns the area of Lorca with a maximum acceleration for construction design of 0.19 g. However, the recent earthquake reached a magnitude of 5.2 and generated a much higher acceleration of 0.36 g.
"The area's hazard level was underestimated because until now estimations have been based on the historical earthquake catalogue which only records events from the last 2000 years," points out Martínez. The researcher believes that the fault activity parameters obtained through paleoseismic studies like this can help to improve risk calculations. But will they be capable of predicting the next high magnitude movement? The authors stress that it is indeed possible to determine the maximum magnitude as well as the location of the earthquake. However, at present there is still no way of predicting the moment it will strike, as this involves a complex geological phenomenon governed by non-linear physical processes. "Earthquakes like the one in Lorca and ones before produce fault stress changes which increase in certain points of the fault. We know this thanks to models and results that we have published from previous studies. The next earthquake is more likely to occur in these areas. However, estimating when is impossible," ensures the scientist. With regards to the study recently published in the 'Nature Geoscience' journal that alludes to water extraction being the possible cause of the 2011 earthquake in Lorca, the researcher is doubtful. "There is much scientific discussion on the matter, we are part of various groups that have been working in the area for some time and I am not the only one who is sceptic of the idea. The 2011 earthquake in Lorca was similar to those that took place in 1674 and 1818 at a time when aquifer exploitation was not practiced. I believe that there is no need to search for any unusual reason behind the earthquake. It was down to the fault's natural tectonic evolution. It was a completely normal earthquake from a geological point of view – the small magnitude kind which occurs on a fault every so often," concludes Martínez. More information: María Ortuño, Eulalia Masana, Eduardo García-Meléndez, José Martínez-Díaz, Petra Štěpančíková, Pedro P. Cunha, Reza Sohbati, Carolina Canora, Jan-Pieter Buylaert, and Andrew S. Murray, "An exceptionally long paleoseismic record of a slow-moving fault: The Alhama de Murcia fault (Eastern Betic shear zone, Spain)", Geological Society of America Bulletin 1474 – 1494, 2012.